<h2>Antimatter plasma reveals secrets of deep space signals</h2><br /><p>For 50 years, astronomers have puzzled over strange radio waves and gamma rays thrown out from the spinning remnants of dead stars called pulsars.</p> <p>Researchers believe that these enigmatic, highly-energetic pulses of radiation are produced by bursts of electrons and their antimatter twins, positrons. The universe was briefly filled with these superheated, electrically charged particles in the seconds that followed the Big Bang before all antimatter vanished, taking the positrons with it. But astrophysicists think the conditions needed to forge positrons may still exist in the powerful electric and magnetic fields generated around pulsars.</p> <p>‘These fields are so strong, and they twist and reconnect so violently, that they essentially apply Einstein’s equation of E = mc<sup>2</sup> and create matter and antimatter out of energy,’ said Professor Luis Silva at the Instituto Superior Técnico in Lisbon, Portugal. Together, the electrons and positrons are thought to form a super-heated form of matter known as a plasma around a pulsar.</p> <p> <div class="quote-view quotesBlock quote_horizontal"> <div class="quotesTop"><img src="https://horizon-magazine.eu/sites/all/themes/horizon/images/quotes_top.png" alt="" title="" /></div> <p>'These fields are so strong, and they twist and reconnect so violently, that they essentially apply Einstein’s equation of E = mc<sup>2</sup> and create matter and antimatter out of energy. '</p> <blockquote><p>Professor Luis Silva, Instituto Superior Técnico in Lisbon, Portugal</p></blockquote> <div class="quotesBottom"><img src="https://horizon-magazine.eu/sites/all/themes/horizon/images/quotes_bottom.png" alt="" title="" /></div> </div> </p> <p>But the exact conditions necessary to produce a&nbsp;plasma containing positrons remain unclear. 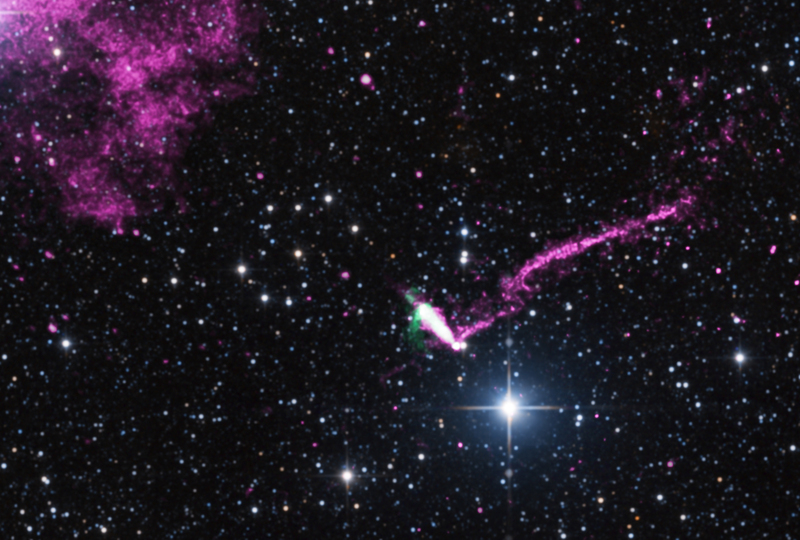 Scientists also still do not understand why the radio waves emitted by the plasma around pulsars have properties similar to light in a laser beam – a wave structure known as coherence. &nbsp;</p> <p>To find out, researchers are now turning to powerful computer simulations to model what might be going on. In the past, such simulations have struggled to mimic the staggering number of particles generated around pulsars. But Prof. Silva and his team, together with researchers at the University of California, Los Angeles in the United States, have adapted a computer model called OSIRIS so that it can run on supercomputers, allowing it to follow billions of particles simultaneously.</p> <p>The updated model, which forms part of the InPairs project, has identified the astrophysical conditions necessary for pulsars to generate electrons and positrons when magnetic fields are torn apart and reattached to their neighbours in a process known as magnetic reconnection.</p> <p>OSIRIS also predicted that the gamma rays released by electrons and positrons as they race across a magnetic field will shine in discontinuous spurts rather than smooth beams.</p> <p>The findings have added weight to theories that the enigmatic signals coming from pulsars are produced by the destruction of electrons as they recombine with positrons in the magnetic fields around these dead stars.</p> <p>Prof. Silva is now using the data from these simulations to search for similar burst signatures in past astronomical observations. The tell-tale patterns would reveal details on how magnetic fields evolve around pulsars, offering fresh clues about what is going on inside them. It will also help confirm the validity of the OSIRIS model for researchers trying to create antimatter in the laboratory.</p> <p><img class="@alignleft@" title="The OSIRIS computer model predicts how powerful magnetic fields around pulsars evolve, helping scientists understand where matter and antimatter can be created out of the vacuum of space. Image credit - Fabio Cruz" src="https://horizon-magazine.eu/sites/default/files/Figure%204%20magnetosphere%20%28InPair%29small.jpg" alt="The OSIRIS computer model predicts how powerful magnetic fields around pulsars evolve, helping scientists understand where matter and antimatter can be created out of the vacuum of space. Image credit - Fabio Cruz" width="1800" height="1273" /></p> <p><strong>Blasting lasers</strong></p> <p>Insights gained from the simulations are already being used to help design experiments that will use high-powered lasers to mimic the huge amounts of energy released by pulsars. The <a href="https://eli-laser.eu/">Extreme Light Infrastructure</a> will blast targets no wider than a human hair with petawatts of laser power. Under this project, lasers are under construction at three facilities around Europe – in Măgurele in Romania, Szeged in Hungary, and Prague in the Czech Republic. If successful, the experiments could create billions of electron-positrons pairs.</p> <p>‘OSIRIS is helping researchers optimise laser properties to create matter and antimatter like pulsars do,’ said Prof. Silva. ‘The model offers a road map for future experiments.’</p> <p>But there are some who are attempting to wield matter-antimatter plasmas in even more controlled ways so they can study them.</p> <p>Professor Thomas Sunn Pedersen, an applied physicist at the Max Planck Institute for Plasma Physics in Garching, Germany, is using charged metal plates to confine positrons alongside electrons as a first step towards creating a matter-antimatter plasma on a table top.</p> <p>Although Prof. Sunn Pedersen works with the most intense beam of low-energy positrons in the world, concentrating enough particles to ignite a matter-antimatter plasma remains challenging. Researchers use electro-magnetic ‘cages’ generated under vacuum to confine antimatter, but these require openings for the particles to be injected inside. &nbsp;These same openings allow particles to leak back out, however, making it difficult to build up enough particles for a plasma to form.</p> <p>Prof. Sunn Pedersen has invented an electro-magnetic field with a ‘trap door’ that can let positrons in&nbsp;before closing behind them. Last year, the new design was able to boost the time the antimatter particles remained confined in the field by a factor of 20, holding them in place for over a second.</p> <p>‘No one has ever achieved that in a fully magnetic trap,’ said Prof. Sunn Pedersen. ‘We have proven that the idea works.’</p> <p>But holding these elusive antimatter particles in place is only one milestone towards creating a matter-antimatter plasma in the laboratory. As part of the PAIRPLASMA project, Prof. Sunn Pedersen is now increasing the quality of the vacuum and generating the field with a levitating ring to confine positrons for over a minute. Studying the properties of plasmas ignited under these conditions will offer valuable insights to neighbouring fields.</p> <p>In June, for example, Prof. Sunn Pedersen used a variation of this magnetic trap to set a new world record in nuclear fusion reactions ignited in conventional-matter plasmas. &nbsp;</p> <p>‘Collective phenomena like turbulence currently complicate control over big fusion plasmas,’ said Prof. Sunn Pedersen. ‘A lot of that is driven by the fact that the ions are much heavier than the electrons in them.’</p> <p>He hopes that by producing electron-positron plasmas like those created by the Big Bang, it may be possible to sidestep this complication because electrons and positrons have the exact same mass. If they can be controlled, such plasmas could help to validate complex models and recreate the conditions around pulsars so they can be studied up close in the laboratory for the first time.</p> <p>If successful it may finally give astronomers the answers they have puzzled over for so long.</p> <p> <div class="moreInfoBlock"> <h3>What is a pulsar?</h3> <p>First discovered by astronomer Jocelyn Bell in 1967, pulsars are the highly magnetised, rotating remains of stars that have collapsed at the end of their life. They emit beams of gamma rays and radio waves that spin much like the light from a lighthouse. When viewed from Earth, this gives the impression of the radiation arriving in pulses. It is thought that the intense magnetic fields around these dead stars generate clouds of charged particles known as plasmas, which in turn generate the radiation.</p> </div> </p> <p><em>The research in this article was funded by the European Research Council. If you liked this article, please consider sharing it on social media.</em></p> <p><a href="http://bit.ly/newsalertsignup" target="_blank" rel="noopener noreferrer"><img src="https://horizon-magazine.eu/sites/default/files/news-alert-final.jpg" alt="" width="983" height="222" /></a></p> <br /> <img src=”http://www.google-analytics.com/collect?v=1&tid=UA-40077089-1&cid=antimatter-plasma-reveals-secrets-of-deep-space-signals&t=event&ec=republish&ea=read&el=antimatter-plasma-reveals-secrets-of-deep-space-signals&cs=republish&cm=republish&cn=republish&cm1=1" /> This post <a href="https://horizon-magazine.eu/article/antimatter-plasma-reveals-secrets-deep-space-signals.html">Antimatter plasma reveals secrets of deep space signals</a> was originally published on <a href="https://horizon-magazine.eu/">Horizon: the EU Research &amp; Innovation magazine | European Commission</a>. ‘These fields are so strong, and they twist and reconnect so violently, that they essentially apply Einstein’s equation of E = mc2 and create matter and antimatter out of energy,’ said Professor Luis Silva at the Instituto Superior Técnico in Lisbon, Portugal. Together, the electrons and positrons are thought to form a super-heated form of matter known as a plasma around a pulsar.